Niagara Falls has been on our Travel Bucket List for awhile now. Have you been? There are pros and cons to visiting Niagara Falls during the off-peak season or, as I affectionately refer to it, the cold, frozen winter. The pros include lower prices on lodging and fewer tourists to contend with. The cons involve possibly bad weather and not all tourist attractions will be open. Can you guess which option is more appealing to our family? Let me grab my coat and scarf because I really loathe long lines and I’m a big fan of saving a buck! The only caveat that would make this a dealbreaker for us if there was an attraction we really wanted to experience that wasn’t open during off-peak season. In Niagara Falls, most of the riverboat cruises do not operate during the winter, but seeing the falls from that vantage point wasn’t super important to us. Maybe because we’ve been on similar excursions on other rivers. Or maybe we just didn’t know what we would be missing! Either way, we had a great time. FIRST, WHY IS NIAGARA FALLS IMPORTANT? Niagara Falls is not one, but three waterfalls comprised of American Falls, Horseshoe Falls and Bridal Veil Falls. So why is it important? After all, it isn’t the tallest waterfall(s) in the world. No, but the sheer amount of water running over the falls is what makes it so impressive. 6 million cubic feet of water flows over the falls every minute during the day during peak tourist season. The amount of water you will see on your trip was established in a bilateral treaty in 1950 between Canada and the U.S. 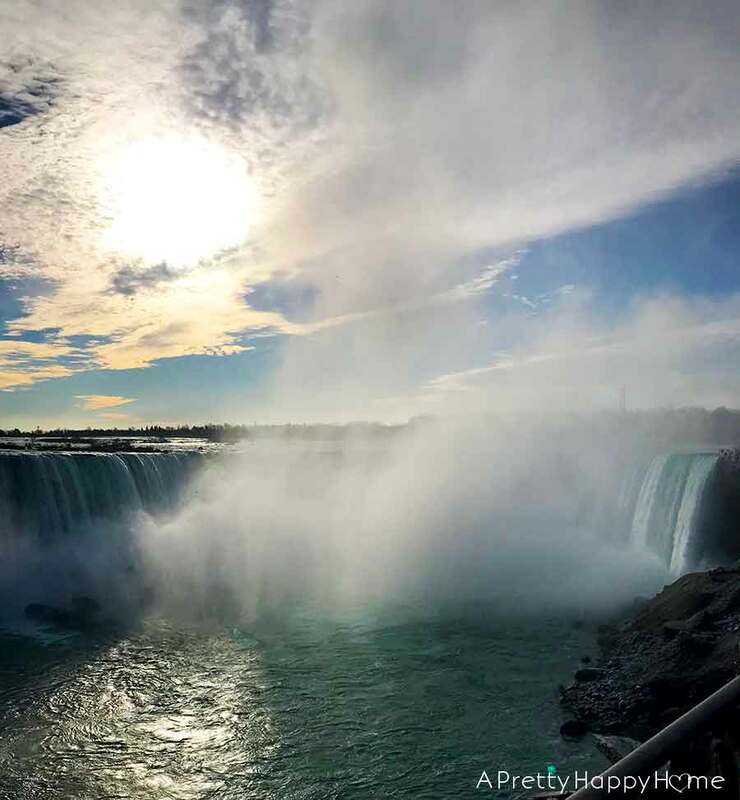 While the ‘curtain’ of water you will see is definitely impressive, it is even more so when you realize you’re only seeing 25 – 50% of the river’s capacity flowing over the falls at any given time. Put another way, at least half of Niagara River’s water is being diverted for hydroelectricity. Because of the sheer force of the water’s movement, Niagara Falls is also forever changing. The falls has not always been located in this exact area. It has moved backward approximately 7 miles in the last 12,500 years to its current location and it continues to erode at the rate of about 1 foot per year. As you know by now, we travel for fun, but also, much to my children’s dismay, to learn. The statistic I found the most interesting is that close to 20% of the world’s freshwater runs over Niagara Falls. Let that sink in. ONE FIFTH of the freshwater IN THE WORLD. Where does the water come from? It is drainage from four of the five Great Lakes: Superior, Michigan, Huron and Erie. The water flows from the lakes, down the Niagara River, over the falls and then empties into the fifth lake, Lake Ontario. Now, here is the last fact to blow your mind. Less than 1% of the water in the Great Lakes that is flowing over Niagara Falls is renewable on an annual basis. Meaning water from precipitation or groundwater. 99% of the water is what scientists call, and I’ve never heard this term, fossil water. Water that is left over from the last Ice Age. I’ll stop nerding out on you now, but check my stats and learn more about the history and geology of the falls at Niagara Falls USA and Niagara Parks. SHOULD YOU VISIT THE CANADIAN SIDE OR THE U.S. SIDE? Niagara Falls is shared by both Canada and the U.S. Which side should you visit and do you need to visit both? Great questions! I like this give and take we’ve got going on here. I don’t think I’m being biased when I say the Canadian side has the better views of the falls. 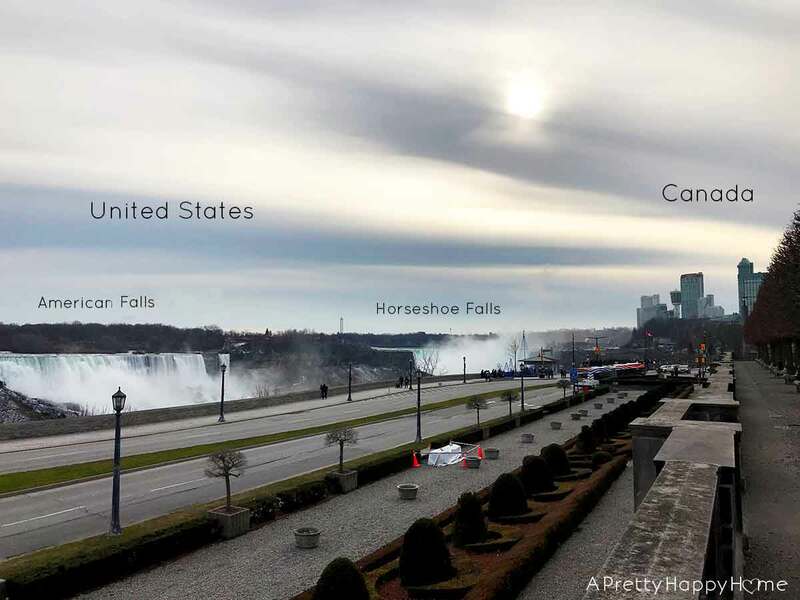 If you are standing on the Canadian side, you have a direct, panoramic view of both American and Horseshoe Falls. From the American vantage point, you are standing alongside the falls, so the view is close and impressive, but not as sweeping. Also, from the American side your backdrop is the very developed, tourist-centric Canadian side with its high-rise hotels and casino buildings. There is far less development on the U.S. side. The Canadian side is where you want to stay if you want an abundance of lodging, entertainment and dining choices. Our impression of Niagara Falls on the U.S. side is the park is what you would expect from a major state park or historic site, but the area outside the park leaves a little to be desired at this time. My recommendation if you are traveling from the U.S. side and have a passport is to cross over into Canada – even if it is just for the afternoon. It’s worth it. The toll fee for vehicles (as of 12/2018) is US$3.75 or CAN$4.75, but if you are walking across Rainbow Bridge, the pedestrian fee is US/CAN$1. Every website says you can walk across, I just didn’t notice the path when we were driving and Handy Husband didn’t think I should be taking pictures of our border crossing. Ha! Also, if you have a U.S. passport and want a stamp on your passport, you’ll have to ask the Canadian border official nicely for one. Your entry is all recorded electronically now, so the passport stamp isn’t always necessary. Our kids are really into collecting passport stamps as proof of their travels and the Canadian border official was super gracious in stamping our passports when I asked. Niagara Falls, Canada, is a completely walkable town. Yes, my definition of “walkable” might be different from yours, but I think most of you can handle this town. 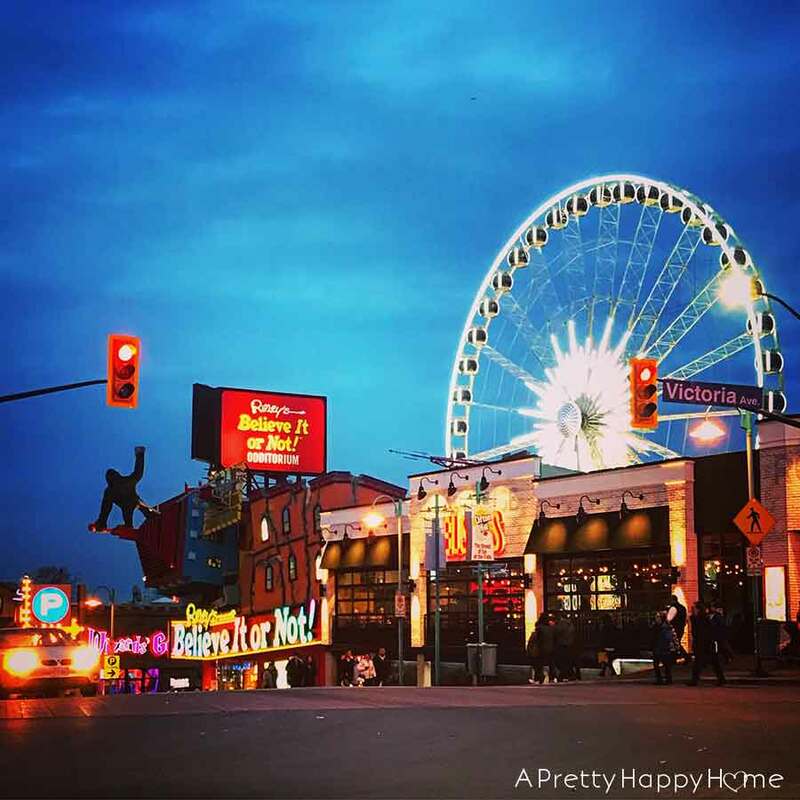 There’s the tourist hub of Clifton Hill, with a few blocks of entertainment, hotels and restaurants. Adjacent to that there’s a large sidewalk along Niagara Parkway that follows the river straight to the falls and the tourist activities located there. In my experience, you can walk from one end to the other in 15 minutes or less with two kids in tow who are dragging their feet. See? Totally doable! Clifton Hill is a self-described street of fun. I was going to call it a tourist trap on steroids. Potato, potat-oh. 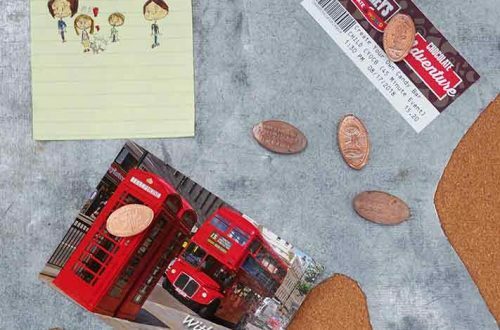 It’s designed to take your money as fast as possible in a visually appealing way. You want to be mad about it, but it’s so well done that it’s kind of impressive. Does that make sense? If you want to do Ripley’s Believe It or Not, 4-D theaters, giant ferris wheel, indoor waterpark, casino, wax museum, go kart racing, house of mirrors, bowling, haunted house, arcade, minigolf – it’s ALL THERE. 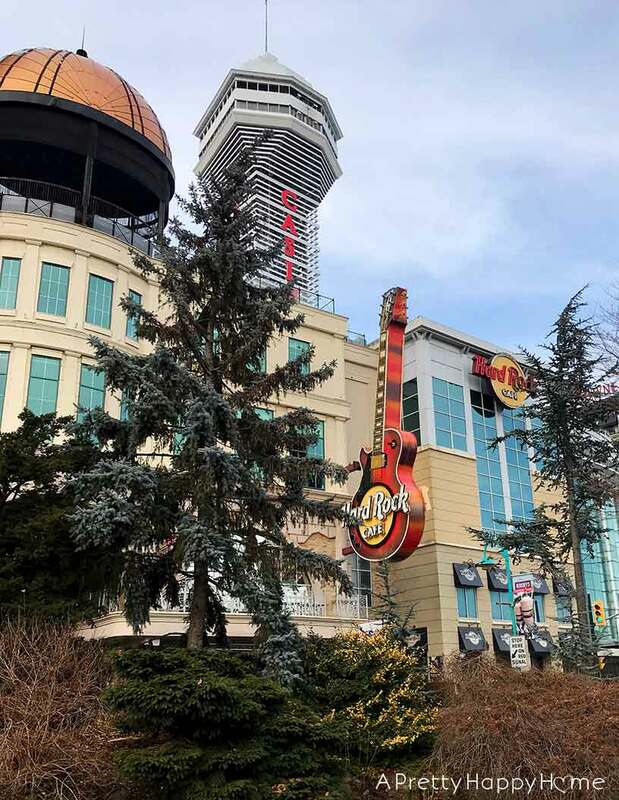 Our kids picked one thing to do on Clifton Hill and we also stopped at the entrance of many of the attractions because almost all of them have some sort of free gimmick you can look at or take pictures with: a floating sphere, a giant moose, etc. For more details on Clifton Hill attractions or to take advantage of their special offers, click here. Between the Clifton Hill area and Horseshoe Falls there is a wide pedestrian path that follows the river. This is where you will take all your pictures of American Falls and Horseshoe Falls. You may even get wet from the spray coming up from Horseshoe Falls. You can’t tell from the below picture, but this was a dry, fairly sunny day. I swear! All the moisture in the air and on the ground in the below picture is from the spray rising up from Horseshoe Falls. That’s how close you are to the action! If you are visiting Niagara Falls during Christmas, make sure you take the stroll along the river at night too. There is a park area that follows the pedestrian path that is lit up with thousands of Christmas lights and it is absolutely magical. 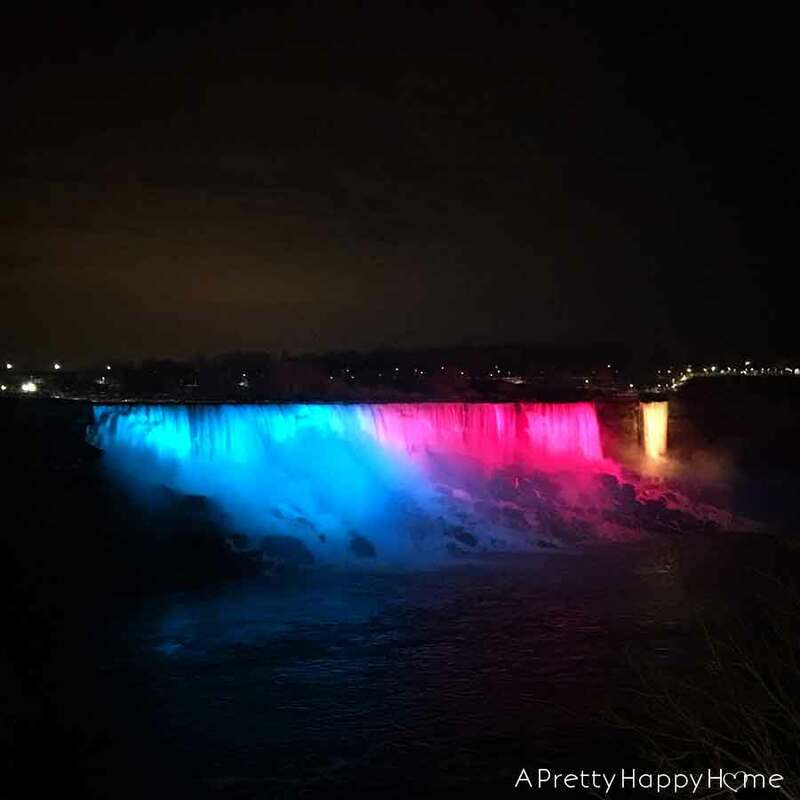 Also at night American Falls and Horseshoe Falls will be illuminated in different colors. I think I enjoyed this more than seeing the falls during the day! Is that wrong? That’s probably wrong! If you are visiting over Christmas break, there may also be a fireworks show around 9 p.m. on many nights. For more information on the year-round falls illumination, click here. Journey Behind the Falls was my favorite part of our Niagara Falls experience. 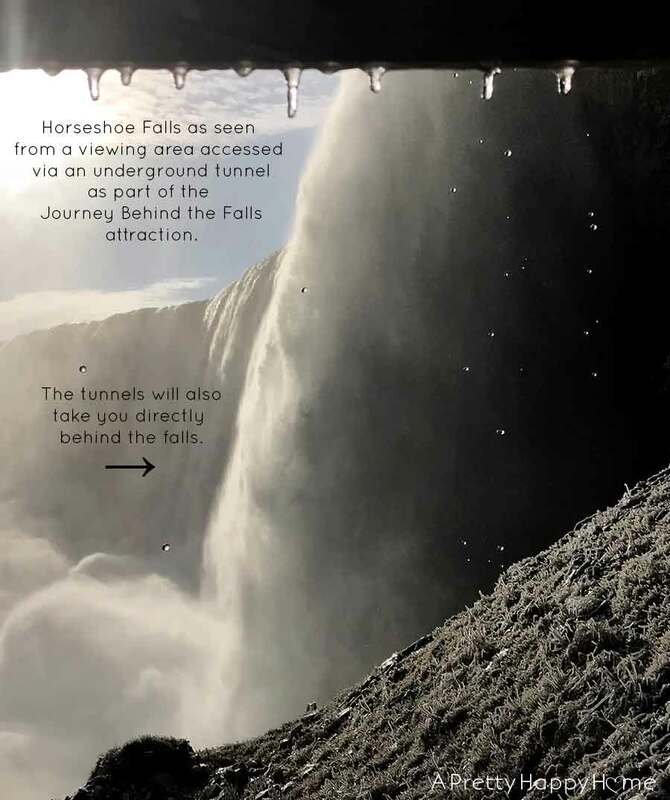 You’ll take an elevator down 125 feet that opens up to tunnels behind Horseshoe Falls. These tunnels were blasted 130 years ago! Although, I’m fairly certain they’ve been structurally shored up since then! If you really want to get up close and personal to the falls in the winter, I highly recommend this attraction. You won’t be able to get this close on the American side of the falls during the winter because they dismantle the Cave of the Winds walkways every year. For Journey Behind the Falls tickets and opening times, click here. Consider purchasing the Wonder Pass that combines 4 of the Niagara Parks attractions and free access to public transportation for one discounted price. It’s what we did and it was very convenient to have and use. In the same building as the Journey Behind the Falls attraction is Niagara’s Fury. This was my children’s (ages 8 and 11) favorite part of our trip. The first part of the show is a 10-minute cartoon about how Niagara Falls was created. It’s very well done, so adults shouldn’t be put off by the cartoon aspect. Then you’ll proceed into a standing theater of sorts. Oh! The best part? You’ll be given rain ponchos to wear! There are screens all around you in this 4-D theater and the show is designed to sort of make you feel like you are floating down the river toward the falls. You’re wearing ponchos because mist comes down from the ceiling during this experience. For Niagara’s Fury tickets and opening times, click here. I’m sure you’re not associating Niagara Falls with butterflies. I didn’t either. However, we purchased the Wonder Pass from Niagara Parks, which combines multiple attractions and public transportation into one pass. 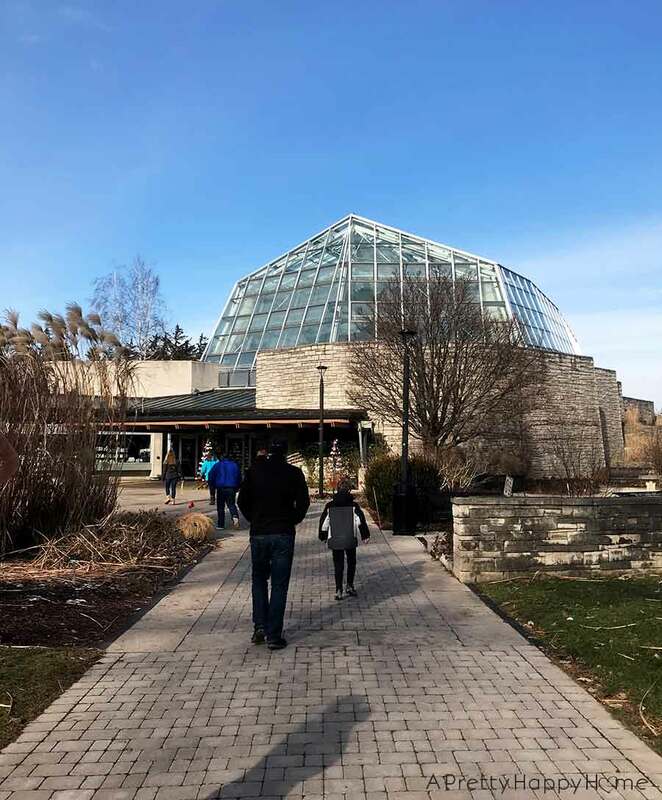 The Butterfly Conservatory was on the list, so we went! Even in the winter, the grounds were beautiful. There’s a cafe on site if you need a cup of coffee or a bite to eat. The Butterfly Conservatory was typical of the ones I’ve visited in other places. You’ll enter a super lush, tropical habitat filled with thousands of butterflies. If you’re lucky, one might even land on you. 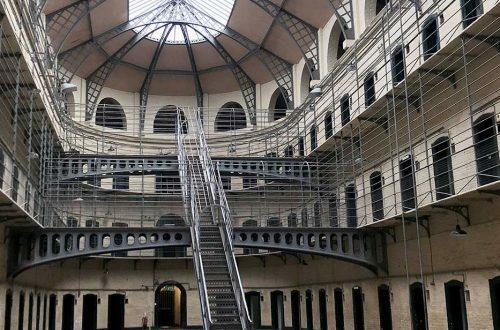 If you are visiting in the winter, take advantage of their free coat room. It must be 80 degrees in the butterfly area and you’ll be much more comfortable if you hang up your coat before you enter. Also, if you take the WEGO bus (that’s the one that is free with the Wonder Pass) to the conservatory, it comes every 30 minutes or so in the winter. You’ll want to time your visit accordingly or take advantage of the onsite cafe while you wait for your ride back into town. Please don’t feel intimidated by the WEGO bus if you aren’t a frequent user of public transportation. To ‘pay’ for your ride you just scan your Wonder Pass when you board. The bus route to the attractions on your Wonder Pass is pretty much a straight line and the driver announces every stop, so it’s hard to get lost. For more information on The Butterfly Conservatory, click here. There are a ton of American restaurants in Niagara Falls, Canada, for your dining pleasure. Just what you were looking for, right? We also loved the soft serve ice cream from the delicious, but questionably-named shop Sweet Jesus. For a list of restaurants in Niagara Falls, Canada, including some actual Canadian ones click here. The benefit of visiting Niagara Falls in the winter or over Christmas is that hotel rates are really, really low. There were a few US$39 hotels available. I tend to be skeptical of those hotels, but there were many that were between US$50 and $100 per night that included breakfast and parking. For our family of 4, having breakfast included is going to save us at least US$30. Parking is a savings of around CAN$15 per day. There is also a cluster of B&Bs right along the river. This B&B district is a little far from the falls from a walking perspective, but public transportation stops in that area regularly making it more convenient to get to the touristy areas. We stayed at the Clifton Victoria Inn. It’s an older hotel that won’t ‘wow’ you, but it was clean and the free breakfast was more robust than I expected. My kids weren’t super impressed with the wifi though. Don’t you feel bad for them? Ha! For a list of hotels in Niagara Falls, click here. 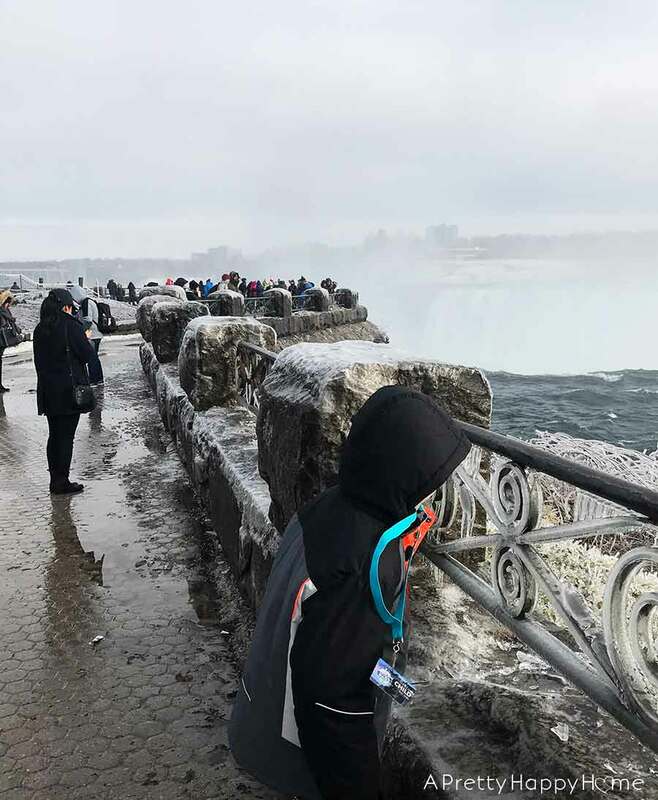 Yes, we spent 99% of our trip to Niagara Falls on the Canadian side of the border, but I would be remiss if I didn’t mention the things you can do during the winter on the U.S. side of the border. Niagara Falls State Park is accessible year-round, but some of the major tourist aspects of the park are closed. This includes Cave of the Winds and some of the paths closest to the falls. You can visit the World Changed Here Pavilion, Adventure Theater, or the Aquarium of Niagara among other places. The smart folks at Niagara Falls Tourism also offer a bunch of coupons (Winter Wonder Savings Pass) if you visit the area in the winter. As you know, we LOVE our state and national parks. This park is very well done, but it would be better experienced in the summer and that’s the tradeoff of visiting when we did. Parking tip! If you enter the park before opening hours AND the gate is up, you don’t have to pay for parking. We accidentally learned that little tip. For the record, we tried to pay, but I guess the machine wouldn’t accept money until 9 a.m. and the park ranger told us not to worry about it. 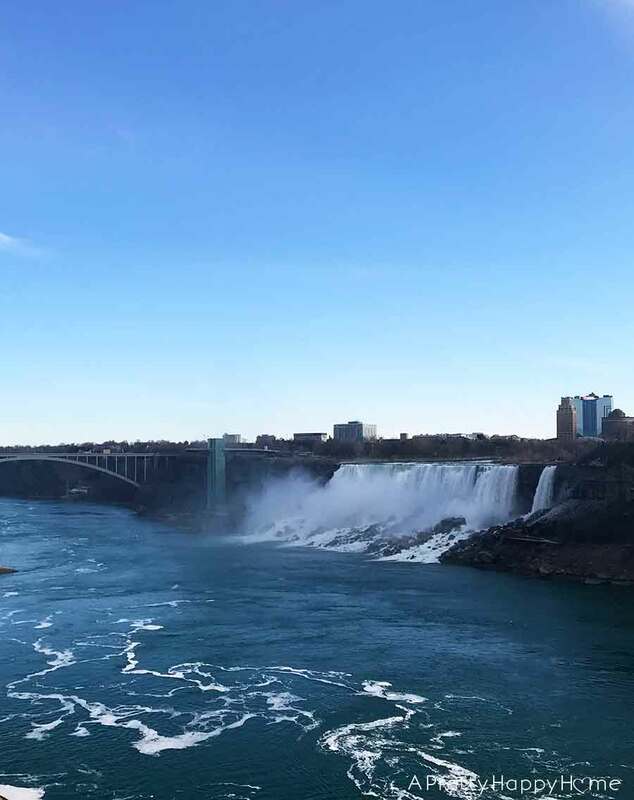 To learn more about Niagara Falls State Park and a full list of things to do in Niagara Falls USA, click here. If you are an American visiting Canada, always check the exchange rate before you plan a trip. Food and activities (even taxes) are quite expensive in Niagara Falls, Canada. Having a favorable exchange rate will make your visit much more palatable. When we visited in December 2018, US$1.00 equaled approximately CAN$1.36. The only time we used cash on our trip was paying our toll fee to cross into Canada and we paid that in U.S. dollars. Other than that, we never felt the need to use cash, which isn’t always the case when traveling out of the United States. I recommend letting your credit card company know you’ll be traveling across the border so you don’t encounter any problems with fraud alerts. If we were to do this trip over, we would have planned a day experiencing Niagara Falls (that’s all we really needed during the winter) and then added time onto our trip to experience Toronto. The benefit for us of living within driving distance of the Canadian border is we can always go back. All in all, I am so happy we saw Niagara Falls. Not just because it was on our Travel Bucket List, but because it is an amazing natural wonder and resource. I didn’t care too much for the touristy, non-falls related aspects of Niagara Falls, but I understand why that part of the area is there and thriving. To me, the most enriching part of the experience was learning about and exploring the falls area itself. Now I can look forward to the next adventure…whatever that may be! 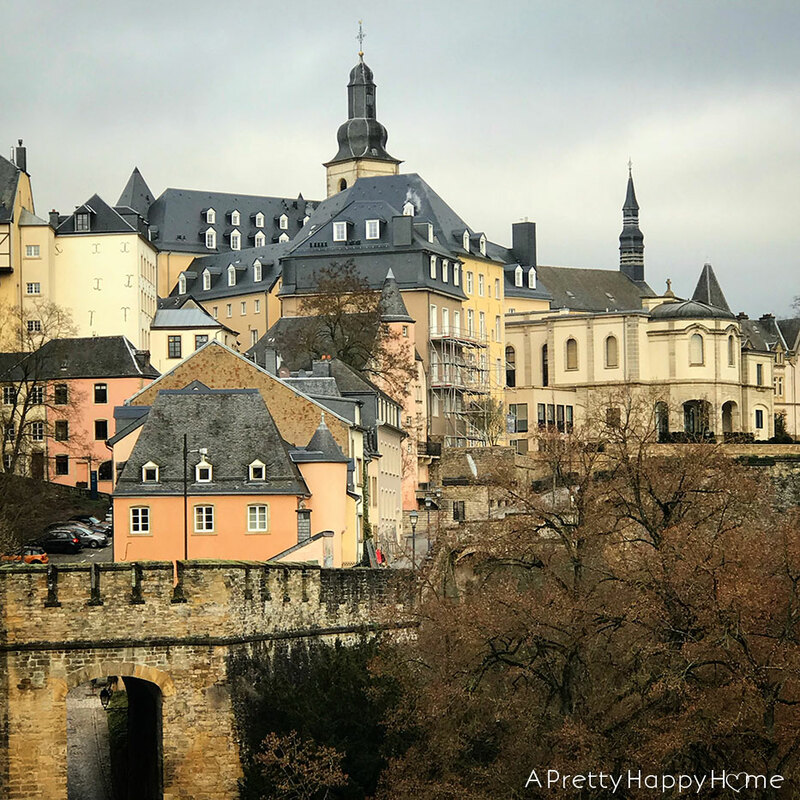 If you enjoy travel, you may like one of these posts!